WHETHER IT BE A RESIDENTIAL OR COMMERCIAL APPLICATION, WE CAN PROVIDE ALL YOUR CONCRETE NEEDS WITH A QUALITY PRODUCT. Concrete flatwork provides the backbone of our business. From basic driveways, sidewalks and approaches to custom designed patios, porches or pool decks, we can replace your current concrete or place a new installation. 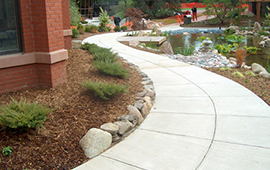 Whether it be a residential or commercial application, we can provide all your concrete needs with a quality product. 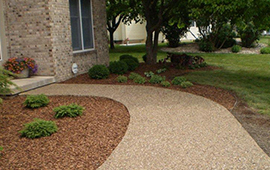 Schedule free home consultation with our certified flatwork / pervious concrete specialist today. Ready to get rid of that hot, black asphalt driveway? Tired of the mud puddles that accumulate in your gravel driveway? Have the slabs in your driveway shifted so much so they are causing trip hazards? 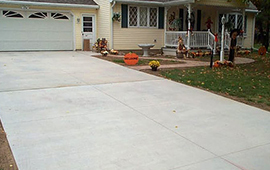 Call us to install a new concrete driveway on a quality sub-base that will make you smile. Looking to create a backyard getaway retreat? Let us help you design the perfect patio to meet your budget and your needs. From a basic concrete square to a curved and colorful, stamped patio with sidewalk extending around your house – we have done it all. 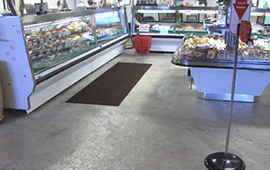 From a wood plank concrete dance floor to a tough epoxy finish to a custom acid stain design – we can provide a concrete floor that will give you years of service with low maintenance costs. Want something different using natural stone? Then exposed aggregate concrete is what you are looking for. From a final gravel finish to the rough surface of crushed black granite, we can achieve the natural look you are searching for. Smart use of water resources is one concern of the green building movement. 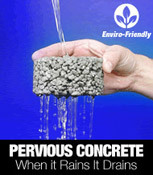 Pervious concrete enables rain water to return to the natural water table, rather than running off and causing erosion issues and filling up storm sewers.